Hi all and welcome to your third week of advice from FFLibrarian writer, Bob, who always brings his streaming defense genius our way. Enjoy and good luck! Wow! What a week for surprises, disappointments, and clarity. Did anyone see the Jaguars beating Miami? There went a lot of survival pools. Romo going down? That’s got to fry FFLibrarian writer Jen Ryan, the ultimate Cowboys fan. But there was some clarity on the Defensive side of things. The Jets are even better than advertised, and the Broncos could be the revival of the Orange Crush. Speaking of crush, our top defenses really dropped a doogie. And the streams weren’t that much better. Below are the results of week 2 using MFL stats and Fantasy Sharks scoring. Suggested streams are outlined in Blue. 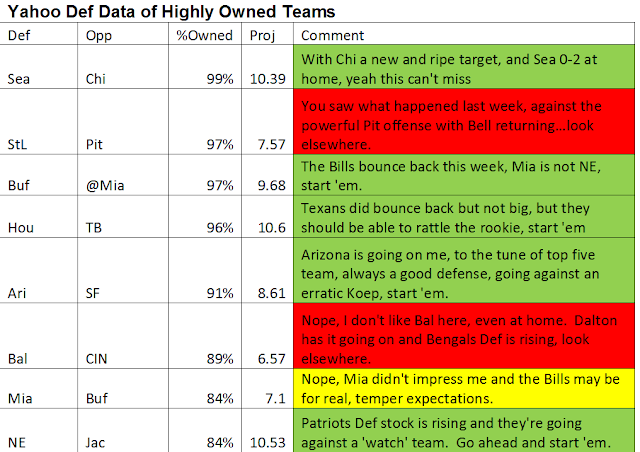 Owned and started are in Green for start, Yellow for temper expectations, and Red for look elsewhere. Our streams did decidedly better than the widely owned teams, but it was a shallow victory. The real winners were the teams that weren’t highly owned OR suggested streams. So what did we learn? As far as targets it got muddier this week as well. The Jags made Mia Def look really bad, so they go down to ‘watch’ status. The Browns proved that the Titans are back on the list of targets. WAS also showed some consistency and found a game plan to confound the feared Rams front seven. Was goes to ‘watch list’. Did other targets emerge? Boy, did they!!! But our new targets have one thing in common: wounded or battered QBs. With Romo down and a running game that has disappointed, his replacement will see a lot of pressure. Dal definitely goes on the watch list. And could things go anymore wrong for the Bears? Cutler is going to miss some time and Clausen is going to be running for his life. Chi goes straight to my target list. Brees will probably play, but is hurt, and the New Orleans offensive line is the cause of his malady. They lost to TB…they go straight to my target list. Stafford is hurt, and will underperform if he starts, Det goes on the ‘watch’ list. With those observations in mind what does Week 2 look like? Here are some links to early streaming advice. They may or may not align with my analysis below. 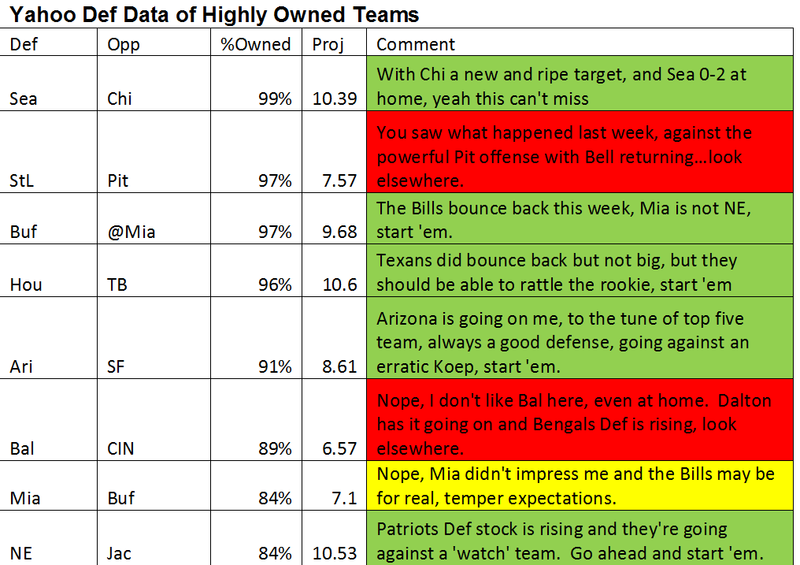 Here are the ownership numbers and projections for Defs this week of the ‘owned’ defenses. Owned being better than 80%. So I like five of the highly owned this week, but here are some juicy streams that could outperform even those. I love the Broncos and Jets this week, but many are citing the Browns and Bengals, who will win out? We’ll see next week. Thoughts on the Falcons v Cowboys or Vikings v Chargers? Although the Cowboys defense is gaining, not against the Falcons. The Falcons will destroy Dallas today. Min is a decent start against the Chargers.